A few weeks ago, I took a day to drive through the Annapolis Valley and meandered through a few vineyards while chatting with knowledgeable and passionate grape growers and winemakers. No trip to the valley ever goes without tasting the local wine and I was treated to some really good drops en route. Grapes have been growing in Nova Scotia since the early 1980’s, while the past 20 years have seen the most dramatic change and growth in the industry with new vineyard plantings, new wineries, and a general rise in overall wine quality and interest both locally and abroad in Nova Scotia wines. When someone asks me for a recommendation for a Nova Scotian wine today, I can confidently suggest many sparkling wines, fresh white wines, roses and many red wines now too. Just like raising a child or cultivating a relationship, to promote any type of healthy growth one must be wholeheartedly committed. In the case of wine, I’ve seen that profound commitment here in Nova Scotia with our grape growers, winemakers and those who promote and sell these products. In the past 15 years I’ve met many determined, passionate and hard working individuals who dare to dream and have the courage, the ability and of course the financial means to help grow this industry. Cheers to these fine people! I am always a proponent of eating fresh, seasonal and local ingredients whenever possible, therefore it only makes sense to complete the meal with a good glass of local wine. Thankfully today we have lots of choices available to us! 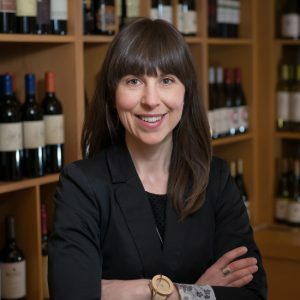 Here is a list of my current favourite local wines, one for every day of the week plus when and how to enjoy them! Ease into your week with something easy and delicious. Enjoy this fresh and zesty, slightly off-dry Riesling with an aromatic and nourishing bowl of spicy curry. A beef (or veggie) chili mole taste even better with the sweet fruit and toasty notes of this soft and balanced medium-bodied red blend of Lucie Khulmann, Castel and Marquette. Get over hump day by trying a new and refreshing Tidal Bay. This biodynamic wine is a blend of L’Acadie Blanc, Geisenheim, Chardonnay and just a hint of the Swiss grape Chasselas. Add a splash of colour to the table by serving a pretty pink rosé with your favourite artfully prepared sushi. Bubbles to celebrate the arrival of the weekend, anyone? Chances are I’m drinking Benjamin Bridge’s Brut; it is yeasty and complex on the nose and lively on the palate; everything I am looking for in a Traditional Method sparkling wine. Throw a dinner party and serve the best icewine that Nova Scotia has to offer with a cheese plate instead of dessert. Forget what you think you know about the style, this icewine knocks it out of the park in terms of aromatic intensity and fruit concentration. Sunday brunch calls for another sparkling wine and I’m going to combine my two loves; pink and bubbles. Salute!